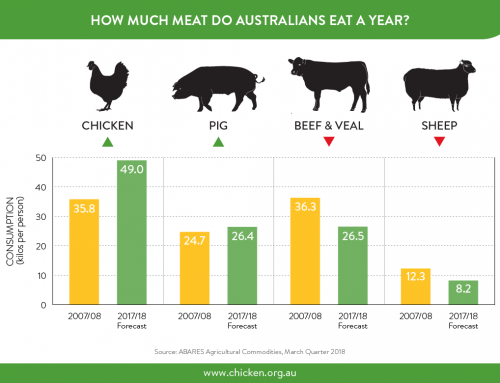 Last month, I talked a little bit about meat chicken behaviour – not just what chickens do, but why it’s important. I foreshadowed that in my next blog I’d explain how chicken farmers use chicken behaviour to read and respond to their birds’ needs. 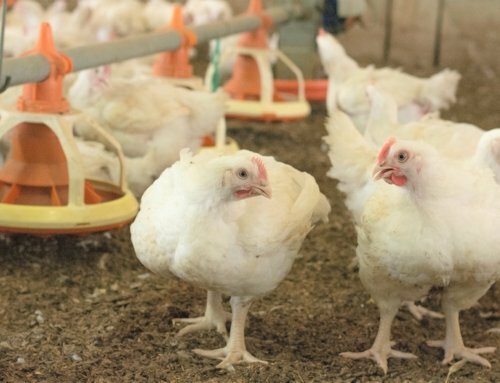 So, what behaviours does a chicken farmer use, and how does he/she interpret them? What does a farmer listen for? Most chicken farmers will tell you that they know, even before entering a shed, if all is OK based on the noise that is coming from the flock. In the daytime, the flock should be making a steady ‘hum’ of normal everyday bird activity and social interactions and the vocalisations associated with these. Hard to express in words, but here goes: a flock of baby chicks should be a chorus of ‘chip chip’; older flocks more of a ‘bwark bwark’ that some of you might relate to! There should not be a chorus of raucous squawking, and if the sound emerging from the flock is too high pitched and loud, there could be something wrong. The general noise level in a shed will increase with anything that might disturb or stress the chickens, including should there be something not right with the feed or water. Can you hear a subtle difference? This is the same group of chickens, but slightly heightened level of alarm (due to an unfamiliar person moving through the flock). Well, this chick woke up and found that his flock mates had moved away from him…and he didn’t much like it until he found his way back to them. What does a farmer look for? 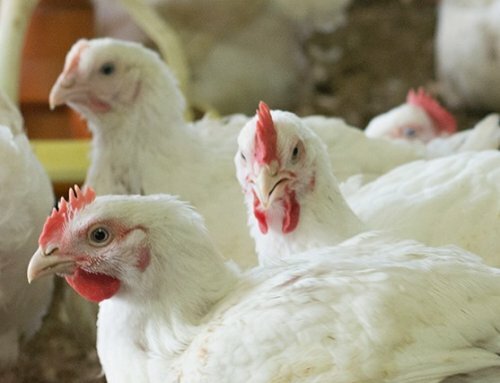 Chickens shouldn’t be overly flighty or fearful – they should certainly move away from you and get out of the way when you move through them, but definitely not panic! They should be alert, even at times of the day when most of them are resting on the floor of the shed; they definitely shouldn’t look listless or depressed. They shouldn’t be panting heavily – that means they are too hot, and the farmer will need to take action to cool the shed down. They should be eating and drinking normally; crowding around the drinkers or feeders could indicate a supply problem. If they are too bunched together – particularly if they are bunched together in particular parts of the shed – they might be too cold, and shed ventilation may need to be altered. 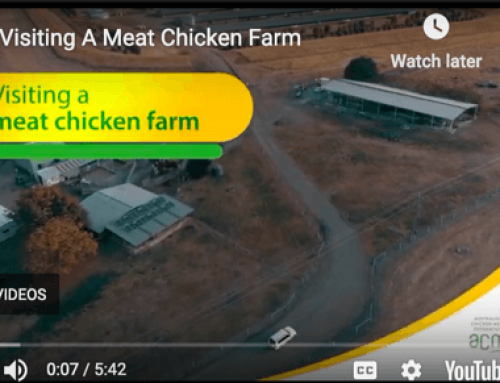 How the chickens are distributed around the shed tells the farmer a great deal. If they are not using the whole shed floor area, it could also be telling the farmer that the shed is too hot, too cold or that there are areas where the litter on the floor is wet or uncomfortable – all possibilities that the farmer will need to investigate and address. Depending on the time of day, they should generally be doing particular things; there will be times of day when the chickens would be expected to mostly be resting, and other times that the farmer would expect that their chickens should be engaged in a range of different activities – some resting, some standing, walking, scratching around, feeding and drinking, and interacting with each other. 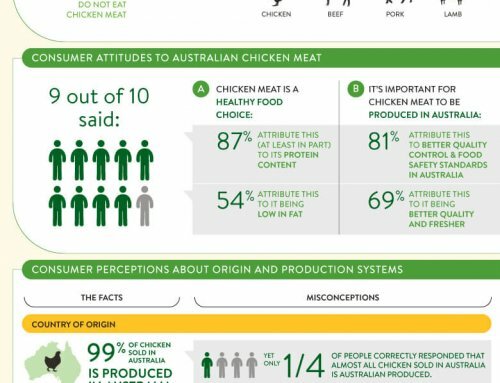 A good chicken farmer is therefore more than just a ‘farmer’…he/she is a genuine ‘stockperson’ and an expert interpreter of chicken behaviour. NEXT MONTH: As we approach Christmas, its time to remind ourselves of the key principles of food safety. Do we really understand what we should be doing (and why) when preparing our Christmas roast chicken? Our guest blogger, Dr Kylie Hewson, Assistant Executive Director at the ACMF, will help to answer these questions.